We let our dogs out back and they went straight to the side of our home. Our dog Lucy kept scratching between the house and the shed. Our daughter went out to explore and she saw a long tail and said "Get a box. I think it's a Possum. And it's stuck". The space was so small but she was able to get him into the recycle box. 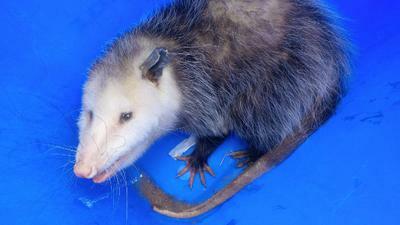 We then called Animal Control and they picked up the poor Possum. He wasn't hissing, he just looked cold. She covered him with a towel and he was soooo happy. Animal control said they would make sure he wasn't injured and would set him free. A little excitement in Misissauga!